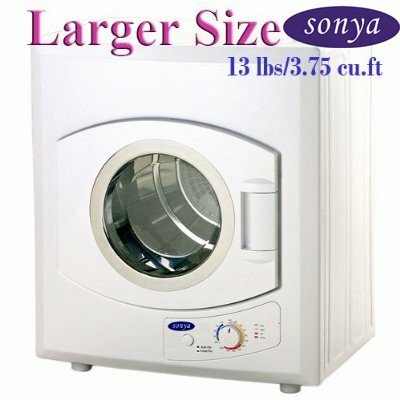 Sonya Portable Compact Laundry Dryer Apartment Size 3.75 Cu.Ft. 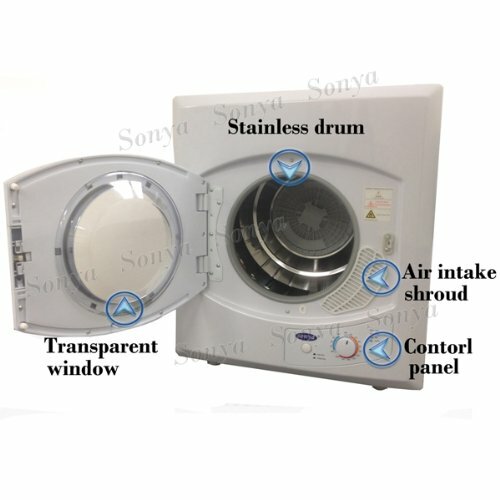 What we have here is a unique compact laundry dryer that incorporates the function and design of a full size dryer. If you’re living in a small apartment, you need a minimized dryer that provides a great service. Sonya portable dryer is exactly the thing you need: an appliance that takes up a minimal amount of space in your small condominium or apartment. Before we tell you more about the features, you should know that this dryer requires electricity to work, so it’s best to be placed near an electric outlet. Capacity (cu.ft. ): 3.75 cu. ft.
Power source of 110V – 120 V / 50 Hz – 60 Hz and can be plugged anywhere you like. Has a stainless steel drum transparent lid. 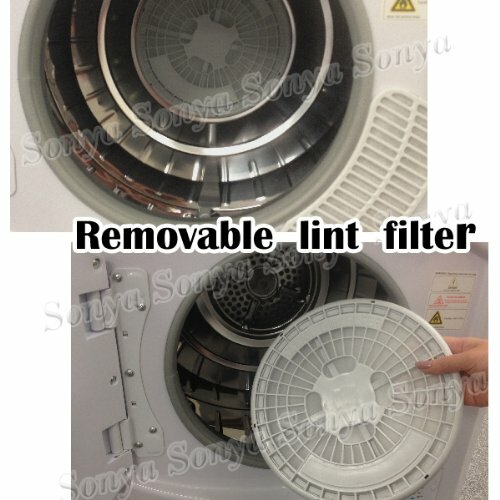 Wall mounting bracket and removable lint filter are also included. Although small, it holds an impressive load of laundry. Runs on four temperature selections: hot – dries large quantities or bulky items, warm – dries on warm temperature, leaving the clothes wrinkle-free, cool – generates cool air, air dry – runs with cool air to freshen the clothes. It’s an energy efficient 1400W dryer. Uses half the energy used by a conventional dryer. Lint filter and wall bracket mount are added, which makes the dryer more convenient to use. 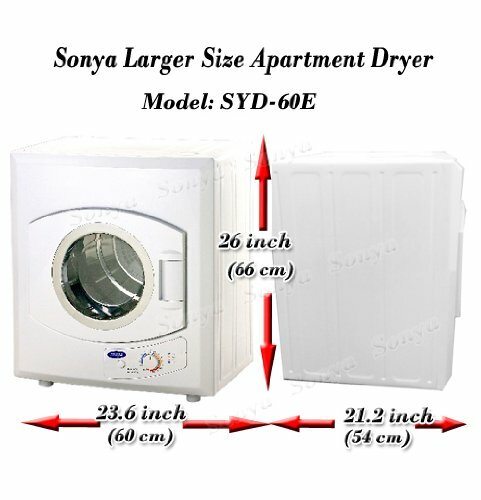 Has a great compact design that makes the perfect dryer for small apartments and condominiums. It’s lightweight, meaning you can move it any time you want to. Repair might be hindered due to lack of nearby professional maintenance technicians. Takes a little more time to dry a full load since it requires half of the standard dryer’s voltage. Some dryers may require a major time commitment for servicing or repairing. 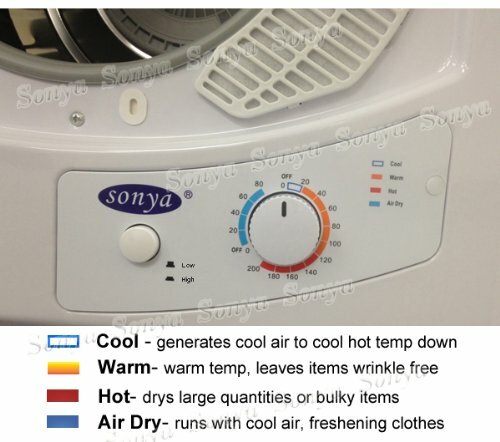 Conclusion: There are plenty of positive comments and reviews for the Sonya portable laundry dryer, but it has some cons as well. However, if you need a small portable dryer that will save you some space, this appliance is a good choice. You have every right to be skeptical due to its size, but it comes at a reasonable price, so if you need a compact laundry dryer, give this dryer a chance.